The recently launched BMW 7 Series now has a prestigious flagship at the head of the range: the new M760Li xDrive V12 marks the debut of a very special V12 engine to provide stunning performance with exemplary refinement. With TwinPower Turbo technology incorporated for the first time, this new M Performance engine produces 600hp and 800Nm of torque. It’s harnessed by a highly sophisticated chassis specifically tailored to the model, and deployed to the road via BMW’s xDrive all-wheel-drive system with a rear-bias for more dynamic handling. The 12-cylinder engine layout traditionally enjoys an exclusive status above all others, and in the new M760Li xDrive V12 provides a superb blend of performance and refinement. The 6,592cc M Performance TwinPower Turbo 12-cylinder engine develops an output of 600hp at 5,500rpm and generates its peak torque of 800Nm from as low down as 1,500rpm.This enables the car to accelerate from zero to 62mph in just 3.9 seconds and on to a governed top speed of 155mph. It now also links up with the Auto Start-Stop function, which is just one measure that contributes to an impressive official combined fuel consumption figure of 22.4mpg and CO2 emissions of 294g/km. For the construction of the all-aluminium block, BMW engineers focused on maximising rigidity while also minimising weight. Using a closed-deck structure, combined with bolts holding the cylinder head down on the floor plate of the crankcase, has ensured the stability of the cylinder liners. Double bolts on the main bearings, with an additional connection to the side panels through threaded support bushes and bolts, reduce the influence of lateral forces from the crankdrive on the crankcase. Further components that serve to reduce vibrations and noise to an absolute minimum are iron-coated aluminium pistons; forged connecting rods assembled using the cracking process, and likewise, a forged crankshaft. Two key features have elevated the performance and efficiency of the new V12 onto an even higher level: M Performance TwinPower Turbo technology and High Precision Injection. Together they enable sharp responses to even the slightest movement of the accelerator, a linear torque curve and exceptionally low fuel consumption and CO2 emissions for a car in this performance class. Under an engine cover bearing “M Performance” lettering are two mono-scroll turbochargers, located – thanks to the small 60-degree cylinder angle – in a compact arrangement on the outside of the two rows of cylinders. Each turbocharger supplies six cylinders with compressed air. Their positioning allows for short, straight and therefore flow-efficient pipe connections between the exhaust system and the turbochargers. A sophisticated indirect intercooler, minimising the overall volume of air required and reducing lag, cools the air from each turbocharger. An additional water pump feeds the separate coolant circuit required for this purpose, whose air-to-water heat exchangers are positioned directly on the intake manifold. The engine’s catalytic converters are equipped with advanced exhaust gas sensors and quickly reach their optimum operating temperature thanks to their positioning close to the engine, assisting the M760Li xDrive V12 in meeting the EU6c exhaust standard. In order to reduce backpressure, the M sports exhaust system features mostly straight pipes of the largest possible diameter. The evolution of the rear silencers and flap activation system allows everything from maximum refinement to a full-bodied 12-cylinder soundtrack. The adoption of high precision fuel injection optimises the combustion process. Injectors positioned centrally in the cylinder head measure out the fuel precisely and spray it into the combustion chambers in finely atomised form and at up to 200-bar of pressure. The mixture cooling brought about by the directly injected fuel also allows a higher compression ratio than that achieved by a turbocharged engine with manifold injection. The M Performance 12-cylinder engine also features, in customary BMW fashion, Double-VANOS continuously variable camshaft timing. This allows the engine to run under part loads with a high level of residual gas and reduced throttle losses, maximising fuel efficiency. Double-VANOS also contributes to the engine’s rapid responses. Another optimisation with the new engine is the oil supply system. Its volume flow-controlled pump operates only when required and is therefore extremely efficient. An eight-speed Steptronic Sport transmission is fitted as standard in the new M760Li xDrive V12. M Performance-specific tuning of the shift programs delivers sportier gear changes and more instantaneous downshifts throughout the rev range, Launch Control function is also included. The transmission can also be operated via the gearshift paddles on the steering wheel: in manual mode the transmission holds the selected gear even when the engine hits the rev limiter. At the same time, its compact construction, low weight, optimised efficiency and flawless interaction with the Auto Start-Stop function allows it to play a significant role in reducing fuel consumptions and emissions. The new BMW 7 Series already benefits from intelligent lightweight design. The use of rigid yet lightweight carbon fibre elements in the passenger cell’s Carbon Core structure, gives the car a low centre of gravity that forms an ideal basis for a car that boasts fine dynamics and ride comfort. The innovative Executive Drive Pro suspension system, first introduced in the recently launched new BMW 7 Series model range, fully enables this duality of purpose. Executive Drive Pro is an active suspension control system, which links the air suspension and the Dynamic Damper Control system to deliver exceptional spring and damper comfort. It includes the updated version of the Dynamic Drive system, which reduces roll at the front and rear axles. The result is sporty driving characteristics coupled with comfortable suspension, specifically tuned for the M760Li xDrive V12’s more dynamic character. In addition to this the Executive Drive Pro actively looks at the road service ahead to precondition the suspension settings accordingly. The new car is fitted as standard with exclusive double-spoke 20-inch M light-alloy wheels in a Cerium Grey metallic matt finish and Michelin Pilot Super Sport tyres (front: 245/40 R20, rear: 275/35 R20). Integral Active Steering is also standard, the previous planetary gearset used at the front axle has been replaced by a variable steering rack ratio that employs a more direct front axle steering ratio and turns the rear wheels in either the opposing or the same direction when steering, depending on the specific driving situation. All the driving modes of the Driving Experience Control switch have been comprehensively retuned to suit the dynamic character of the new M760Li xDrive V12. A new Adaptive mode includes an anticipatory chassis control function and automatic selection of the driving mode best suited to the situation at hand. The advance information for regulating the combination of chassis systems is gleaned from the driving style analysis readings, data from the navigation system and a stereo camera. BMW’s permanent all-wheel-drive system, xDrive, is also an integral part of the new model. This intelligent system is able to distribute torque between the front and rear axle without restriction, and for this variant has been given a rear-wheel bias in-line with its M Performance character. 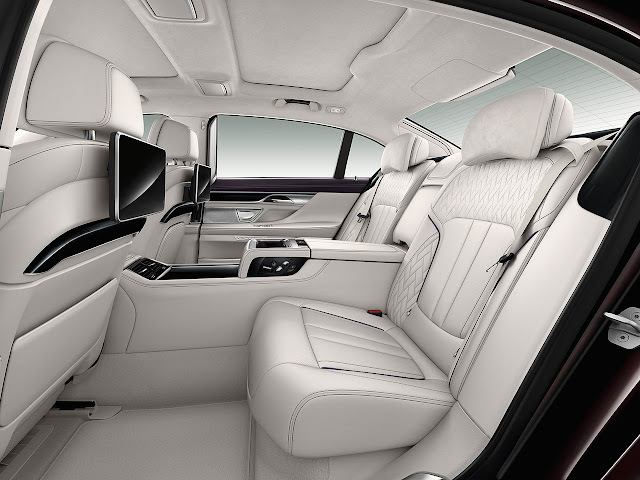 The new car also features the expanded Driving Assistant Plus system optionally available on the new BMW 7 Series model range. The M aerodynamic package fitted as standard to the M760Li xDrive V12 imbues the car with even greater visual presence. The new front apron features two large air intakes with highlights in Cerium Grey. The same colour appears along the sides of the car with trim elements on the lower edge of the doors, the air breathers and the door handle trim. Exclusive mirror caps, “V12” badges on the C-pillars and the M logo on the front wings – once more in Cerium Grey – finish the look. At the rear, the sporting design of the rear apron with its black central area highlights the M sports exhaust system’s Cerium Grey twin tailpipe embellishers. An optional M rear spoiler optimises the flow of air. Inside, carefully selected details emphasise the car’s sporting character: gleaming door sill plates in Fine Brushed Aluminium with an illuminated V12 logo; an M leather steering wheel featuring an M logo on the centre spoke and gearshift paddles on the reverse; multifunction buttons on the steering wheel spokes and the spoke inlays finished in Pearl Gloss Chrome. The instrument cluster contains a special speedometer that now extends as far as 205mph, though in the UK the car is electronically-limited to 155mph. This combined with other elements such as the M pedals reinforces the driver focus of the interior. As expected, the BMW M760Li x Drive V12 features an extremely extensive list of equipment as standard. In addition to the hardware detailed in the sections above, there are BMW Icon adaptive LED headlights with anti-dazzle High-beam assistant, the keyless Comfort Access system and Dynamic safety to optimise occupant protection. 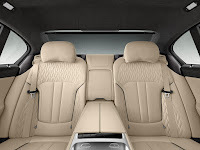 Electrically adjustable Comfort seats at the front and rear, BMW Gesture control, sunblinds for the rear windscreen and rear windows, Exclusive Merino leather trim with extended features, an Alcantara headliner, Fineline black fine wood trim with high-gloss metal effect are also included to name but a few key highlights. BMW ConnectedDrive products and services are also fitted, including the latest-generation BMW Professional Multimedia system with high-resolution colour touchscreen and iDrive Touch Controller. BMW ConnectedDrive Services, meanwhile, enable access to the intelligent link-up of driver, vehicle and outside world. 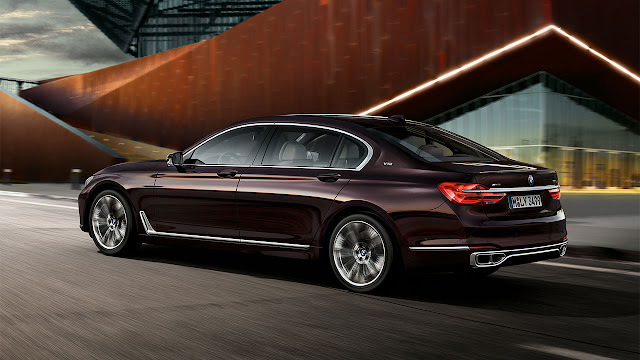 Thus, the BMW M760Li xDrive V12 can be configured and equipped to individual tastes. To this end, customers can choose from virtually the full range of optional equipment available for the new BMW 7 Series. The V12 Excellence Design package shifts the focus away from the dynamic appearance of its M Performance sibling to emphasise the comfort-related attributes of the BMW M760Li xDrive V12. Externally, the V12 Excellence Design package trades the M aerodynamic package for visual cues from the Pure Excellence exterior design package. These include 20-inch BMW Individual light-alloy wheels in W-spoke 646 design, high-gloss polished, with mixed-size tyres (front: 245/40 R20, rear: 275/35 R20) and brake calipers in high-gloss Black. The front end has a chrome bar extending across the full width of the car in the upper section of the air intake grille, while the kidney grille bars are in Silver with chrome fronts, and their surrounds likewise sport bright chrome. LED fog lamps return to the front apron. On the car’s flanks, a bright chrome finish adorns the window frames, the air breathers with door trim element and the V12 lettering on the C-pillars. The M logos rearwards of the wheel arches on the front side panels are deleted. Further back, the xDrive badge sits on the left-hand side of the boot lid above the chrome boot lid handle strip, with V12 lettering replacing the model designation on the right-hand side. The comfort-oriented exhaust system has a refined and understated note. Its two chromed, rectangular tailpipe embellishers are now framed in the rear apron by an additional chrome surround. 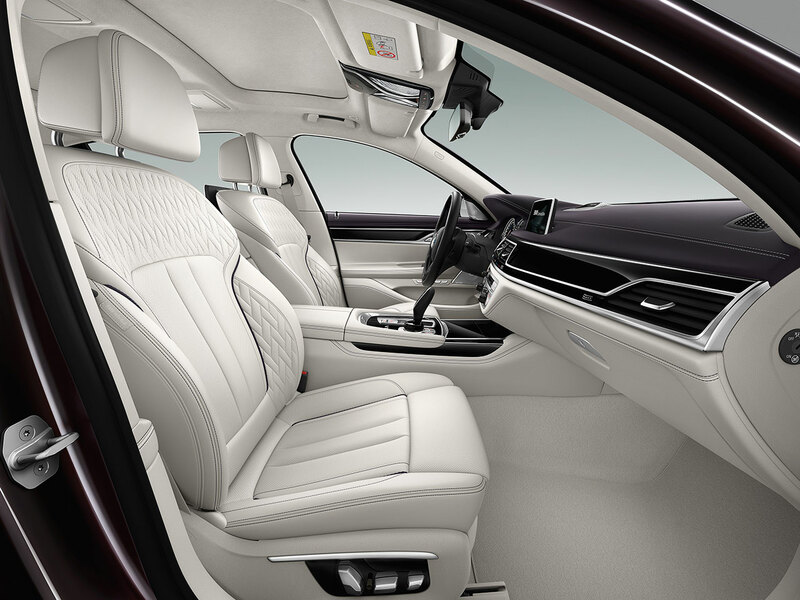 The Pure Excellence interior design package shifts the design focus within the cabin. For example, the Alcantara headliner, door sill plates in Fine Brushed Aluminium with illuminated V12 badge, precise decorative stitching in the lower section of the instrument panel, fine wood inlays for the seat belt outlet covers, armrest and rear roof grab handles, plus deep-pile floor mats for the rear compartment all emphasis further the luxurious nature of the car. The leather steering wheel now features wood elements, and when the driver fires up the engine a V12 emblem lights up in the centre of the instrument cluster – whose speedometer extends as far as 160mph. 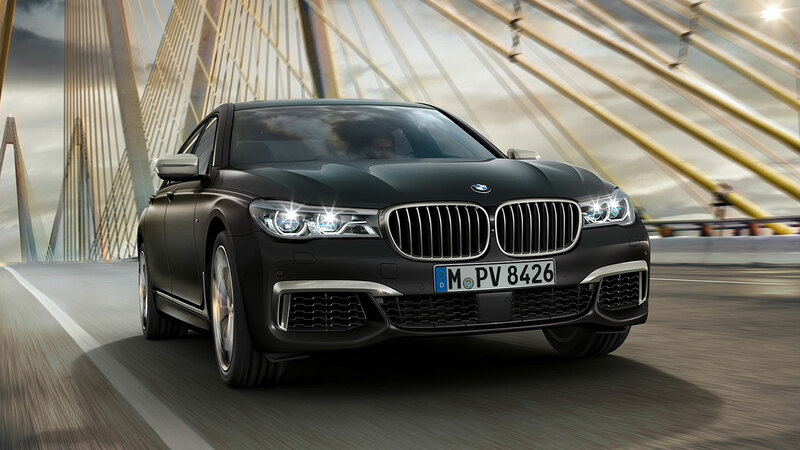 The BMW M760Li xDrive V12 goes on sale towards the end of 2016 with prices being announced nearer the time.